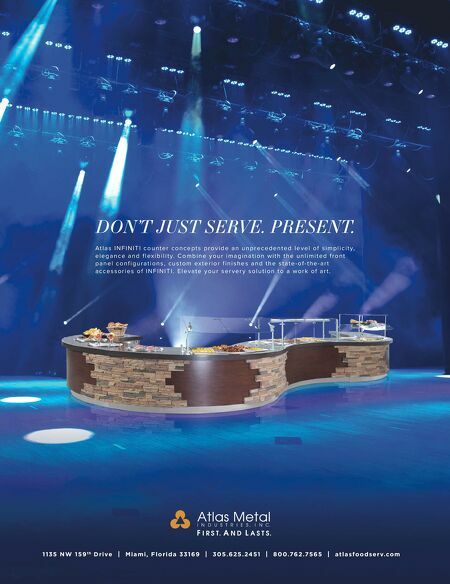 68 • FOODSERVICE EQUIPMENT & SUPPLIES • FEBRUARY 2019 and live design sessions are invaluable tools for the entire team to get a feel for and experience the flow, function, operations and scale." 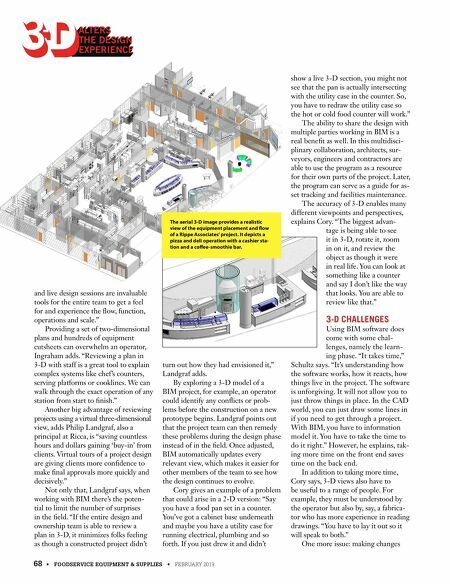 Providing a set of two-dimensional plans and hundreds of equipment cutsheets can overwhelm an operator, Ingraham adds. "Reviewing a plan in 3-D with staff is a great tool to explain complex systems like chef's counters, serving platforms or cooklines. We can walk through the exact operation of any station from start to finish." Another big advantage of reviewing projects using a virtual three-dimensional view, adds Philip Landgraf, also a principal at Ricca, is "saving countless hours and dollars gaining 'buy-in' from clients. Virtual tours of a project design are giving clients more confidence to make final approvals more quickly and decisively." Not only that, Landgraf says, when working with BIM there's the poten- tial to limit the number of surprises in the field. "If the entire design and ownership team is able to review a plan in 3-D, it minimizes folks feeling as though a constructed project didn't turn out how they had envisioned it," Landgraf adds. By exploring a 3-D model of a BIM project, for example, an operator could identify any conflicts or prob- lems before the construction on a new prototype begins. Landgraf points out that the project team can then remedy these problems during the design phase instead of in the field. Once adjusted, BIM automatically updates every relevant view, which makes it easier for other members of the team to see how the design continues to evolve. Cory gives an example of a problem that could arise in a 2-D version: "Say you have a food pan set in a counter. You've got a cabinet base underneath and maybe you have a utility case for running electrical, plumbing and so forth. If you just drew it and didn't show a live 3-D section, you might not see that the pan is actually intersecting with the utility case in the counter. So, you have to redraw the utility case so the hot or cold food counter will work." The ability to share the design with multiple parties working in BIM is a real benefit as well. In this multidisci- plinary collaboration, architects, sur- veyors, engineers and contractors are able to use the program as a resource for their own parts of the project. Later, the program can serve as a guide for as- set tracking and facilities maintenance. The accuracy of 3-D enables many different viewpoints and perspectives, explains Cory. "The biggest advan- tage is being able to see it in 3-D, rotate it, zoom in on it, and review the object as though it were in real life. You can look at something like a counter and say I don't like the way that looks. You are able to review like that." 3-D CHALLENGES Using BIM software does come with some chal- lenges, namely the learn- ing phase. "It takes time," Schultz says. "It's understanding how the software works, how it reacts, how things live in the project. The software is unforgiving. It will not allow you to just throw things in place. In the CAD world, you can just draw some lines in if you need to get through a project. With BIM, you have to information model it. You have to take the time to do it right." However, he explains, tak- ing more time on the front end saves time on the back end. In addition to taking more time, Cory says, 3-D views also have to be useful to a range of people. For example, they must be understood by the operator but also by, say, a fabrica- tor who has more experience in reading drawings. "You have to lay it out so it will speak to both." One more issue: making changes ALTERS THE DESIGN ALTERS THE DESIGN ALTERS THE DESIGN ALTERS THE DESIGN ALTERS THE DESIGN ALTERS THE DESIGN ALTERS THE DESIGN ALTERS THE DESIGN ALTERS THE DESIGN ALTERS THE DESIGN ALTERS THE DESIGN ALTERS THE DESIGN ALTERS THE DESIGN ALTERS THE DESIGN ALTERS THE DESIGN ALTERS THE DESIGN ALTERS THE DESIGN ALTERS THE DESIGN ALTERS THE DESIGN ALTERS THE DESIGN ALTERS THE DESIGN ALTERS THE DESIGN ALTERS THE DESIGN ALTERS THE DESIGN ALTERS THE DESIGN ALTERS THE DESIGN ALTERS THE DESIGN ALTERS THE DESIGN ALTERS THE DESIGN ALTERS THE DESIGN ALTERS THE DESIGN ALTERS THE DESIGN ALTERS THE DESIGN ALTERS THE DESIGN ALTERS THE DESIGN ALTERS THE DESIGN ALTERS THE DESIGN ALTERS THE DESIGN ALTERS THE DESIGN ALTERS THE DESIGN ALTERS THE DESIGN ALTERS THE DESIGN ALTERS THE DESIGN ALTERS THE DESIGN ALTERS THE DESIGN ALTERS THE DESIGN ALTERS THE DESIGN ALTERS THE DESIGN ALTERS THE DESIGN ALTERS THE DESIGN ALTERS THE DESIGN ALTERS THE DESIGN ALTERS THE DESIGN ALTERS THE DESIGN ALTERS THE DESIGN ALTERS THE DESIGN ALTERS THE DESIGN ALTERS THE DESIGN ALTERS THE DESIGN ALTERS THE DESIGN ALTERS THE DESIGN ALTERS THE DESIGN ALTERS THE DESIGN ALTERS THE DESIGN ALTERS THE DESIGN ALTERS THE DESIGN ALTERS THE DESIGN ALTERS THE DESIGN ALTERS THE DESIGN ALTERS THE DESIGN ALTERS THE DESIGN ALTERS THE DESIGN ALTERS THE DESIGN ALTERS THE DESIGN ALTERS THE DESIGN ALTERS THE DESIGN ALTERS THE DESIGN ALTERS THE DESIGN ALTERS THE DESIGN ALTERS THE DESIGN ALTERS THE DESIGN ALTERS THE DESIGN ALTERS THE DESIGN ALTERS THE DESIGN ALTERS THE DESIGN ALTERS THE DESIGN ALTERS THE DESIGN ALTERS THE DESIGN ALTERS THE DESIGN ALTERS THE DESIGN ALTERS THE DESIGN ALTERS THE DESIGN ALTERS THE DESIGN ALTERS THE DESIGN ALTERS THE DESIGN ALTERS THE DESIGN ALTERS THE DESIGN ALTERS THE DESIGN EXPERIENCE ALTERS THE DESIGN EXPERIENCE ALTERS THE DESIGN EXPERIENCE ALTERS THE DESIGN EXPERIENCE ALTERS THE DESIGN EXPERIENCE ALTERS THE DESIGN EXPERIENCE ALTERS THE DESIGN EXPERIENCE ALTERS THE DESIGN EXPERIENCE ALTERS THE DESIGN EXPERIENCE ALTERS THE DESIGN EXPERIENCE ALTERS THE DESIGN EXPERIENCE ALTERS THE DESIGN EXPERIENCE ALTERS THE DESIGN EXPERIENCE ALTERS THE DESIGN EXPERIENCE ALTERS THE DESIGN EXPERIENCE ALTERS THE DESIGN EXPERIENCE ALTERS THE DESIGN EXPERIENCE ALTERS THE DESIGN EXPERIENCE ALTERS THE DESIGN EXPERIENCE ALTERS THE DESIGN EXPERIENCE ALTERS THE DESIGN EXPERIENCE ALTERS THE DESIGN EXPERIENCE ALTERS THE DESIGN EXPERIENCE ALTERS THE DESIGN EXPERIENCE ALTERS THE DESIGN EXPERIENCE ALTERS THE DESIGN EXPERIENCE ALTERS THE DESIGN EXPERIENCE ALTERS THE DESIGN EXPERIENCE ALTERS THE DESIGN EXPERIENCE ALTERS THE DESIGN EXPERIENCE ALTERS THE DESIGN EXPERIENCE ALTERS THE DESIGN EXPERIENCE ALTERS THE DESIGN EXPERIENCE ALTERS THE DESIGN EXPERIENCE ALTERS THE DESIGN EXPERIENCE ALTERS THE DESIGN EXPERIENCE ALTERS THE DESIGN EXPERIENCE ALTERS THE DESIGN EXPERIENCE ALTERS THE DESIGN EXPERIENCE ALTERS THE DESIGN EXPERIENCE ALTERS THE DESIGN EXPERIENCE ALTERS THE DESIGN EXPERIENCE ALTERS THE DESIGN EXPERIENCE ALTERS THE DESIGN EXPERIENCE ALTERS THE DESIGN EXPERIENCE ALTERS THE DESIGN EXPERIENCE ALTERS THE DESIGN EXPERIENCE ALTERS THE DESIGN EXPERIENCE ALTERS THE DESIGN EXPERIENCE ALTERS THE DESIGN EXPERIENCE ALTERS THE DESIGN EXPERIENCE ALTERS THE DESIGN EXPERIENCE ALTERS THE DESIGN EXPERIENCE ALTERS THE DESIGN EXPERIENCE ALTERS THE DESIGN EXPERIENCE ALTERS THE DESIGN EXPERIENCE ALTERS THE DESIGN EXPERIENCE ALTERS THE DESIGN EXPERIENCE ALTERS THE DESIGN EXPERIENCE ALTERS THE DESIGN EXPERIENCE ALTERS THE DESIGN EXPERIENCE ALTERS THE DESIGN EXPERIENCE ALTERS THE DESIGN EXPERIENCE ALTERS THE DESIGN EXPERIENCE ALTERS THE DESIGN EXPERIENCE ALTERS THE DESIGN EXPERIENCE ALTERS THE DESIGN EXPERIENCE ALTERS THE DESIGN EXPERIENCE ALTERS THE DESIGN EXPERIENCE ALTERS THE DESIGN EXPERIENCE ALTERS THE DESIGN EXPERIENCE ALTERS THE DESIGN EXPERIENCE ALTERS THE DESIGN EXPERIENCE ALTERS THE DESIGN EXPERIENCE ALTERS THE DESIGN EXPERIENCE ALTERS THE DESIGN EXPERIENCE ALTERS THE DESIGN EXPERIENCE ALTERS THE DESIGN EXPERIENCE ALTERS THE DESIGN EXPERIENCE ALTERS THE DESIGN EXPERIENCE ALTERS THE DESIGN EXPERIENCE ALTERS THE DESIGN EXPERIENCE ALTERS THE DESIGN EXPERIENCE ALTERS THE DESIGN EXPERIENCE ALTERS THE DESIGN EXPERIENCE ALTERS THE DESIGN EXPERIENCE ALTERS THE DESIGN EXPERIENCE ALTERS THE DESIGN EXPERIENCE ALTERS THE DESIGN EXPERIENCE ALTERS THE DESIGN EXPERIENCE ALTERS THE DESIGN EXPERIENCE ALTERS THE DESIGN EXPERIENCE ALTERS THE DESIGN EXPERIENCE ALTERS THE DESIGN EXPERIENCE ALTERS THE DESIGN EXPERIENCE ALTERS THE DESIGN EXPERIENCE ALTERS THE DESIGN EXPERIENCE ALTERS THE DESIGN EXPERIENCE ALTERS THE DESIGN EXPERIENCE ALTERS THE DESIGN EXPERIENCE ALTERS THE DESIGN EXPERIENCE ALTERS THE DESIGN EXPERIENCE ALTERS THE DESIGN EXPERIENCE ALTERS THE DESIGN EXPERIENCE ALTERS THE DESIGN EXPERIENCE ALTERS THE DESIGN EXPERIENCE ALTERS THE DESIGN EXPERIENCE ALTERS THE DESIGN EXPERIENCE ALTERS THE DESIGN EXPERIENCE ALTERS THE DESIGN EXPERIENCE ALTERS THE DESIGN EXPERIENCE ALTERS THE DESIGN EXPERIENCE ALTERS THE DESIGN EXPERIENCE ALTERS THE DESIGN EXPERIENCE ALTERS THE DESIGN EXPERIENCE ALTERS THE DESIGN EXPERIENCE ALTERS THE DESIGN EXPERIENCE ALTERS THE DESIGN EXPERIENCE ALTERS THE DESIGN EXPERIENCE ALTERS THE DESIGN EXPERIENCE ALTERS THE DESIGN EXPERIENCE ALTERS THE DESIGN EXPERIENCE ALTERS THE DESIGN EXPERIENCE ALTERS THE DESIGN EXPERIENCE ALTERS THE DESIGN EXPERIENCE ALTERS THE DESIGN EXPERIENCE ALTERS THE DESIGN EXPERIENCE ALTERS THE DESIGN EXPERIENCE ALTERS THE DESIGN EXPERIENCE ALTERS THE DESIGN EXPERIENCE ALTERS THE DESIGN EXPERIENCE ALTERS THE DESIGN EXPERIENCE ALTERS THE DESIGN EXPERIENCE ALTERS THE DESIGN EXPERIENCE ALTERS THE DESIGN EXPERIENCE ALTERS THE DESIGN EXPERIENCE ALTERS THE DESIGN EXPERIENCE ALTERS THE DESIGN EXPERIENCE ALTERS THE DESIGN EXPERIENCE ALTERS THE DESIGN EXPERIENCE ALTERS THE DESIGN EXPERIENCE ALTERS THE DESIGN EXPERIENCE ALTERS THE DESIGN EXPERIENCE ALTERS THE DESIGN EXPERIENCE ALTERS THE DESIGN EXPERIENCE ALTERS THE DESIGN EXPERIENCE ALTERS THE DESIGN EXPERIENCE ALTERS THE DESIGN EXPERIENCE ALTERS THE DESIGN EXPERIENCE ALTERS THE DESIGN EXPERIENCE ALTERS THE DESIGN EXPERIENCE ALTERS THE DESIGN EXPERIENCE ALTERS THE DESIGN EXPERIENCE ALTERS THE DESIGN EXPERIENCE ALTERS THE DESIGN EXPERIENCE The aerial 3-D image provides a realistic view of the equipment placement and flow of a Rippe Associates' project. It depicts a pizza and deli operation with a cashier sta- tion and a coffee-smoothie bar.